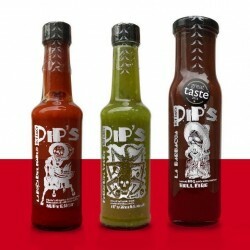 Devilishly spicy chilli sauces, made by chilli heads for chilli heads who love flavour as well as spice. Over a very hungover lunch one day at their favourite foodie pub, The Plough, Pip & Matt were disappointed to find there was no hot sauce. So they wrote a list of ingredients for their perfect sauce, which in turn became a recipe and Pip's Hot Sauce was born. After much experimentation and taste testing they perfected their first sauce, La Boca del Diablo. Back at The Plough for lunch again Pip was spotted pouring La Boca del Diablo all over her food by one of the staff. Intrigued he asked if he could try it, and shared some with the owner too, who then ordered 100 bottles! 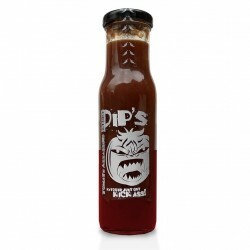 Their artisan hot sauces range from the mild sweet Feugo del Verde to the very hot Nagatropolis. All are hand made by Pip and Matt in Kings Heath, Birmingham, and have been inspired by their love of spice and of using natural ingredients. Winners of the Winter 2014 BBC Good Food Show Award and of a prestigious One Star Great Taste Award in 2016, and then an even more impressive Two Star Great Taste award in 2017 and another Two Star Great Taste Award in 2018.